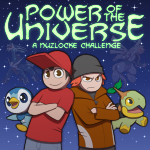 Fresh Pokémon trainers Richard and Aron attempt to take on the Nuzlocke Challenge. All they want is to complete the challenge. Standing in their way is the entire population of Sinnoh. That guy's probably got a few Pokémon League championships under his belt by now. He's not having the best day. I’m sorry was that a middle finger?